This is the deeply silly Bio Disc that the GenGold and QuestNet pyramid schemers are trying to sell us at the moment. 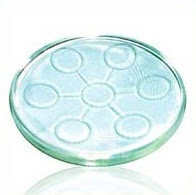 "The Amezcua Bio Disc is made of technically engineered natural minerals which have been structurally bonded in glass, at molecular level, using high heat fusion methods. Through this combination of minerals and fusion techniques, a positive energy field is created." The Bio Disc is a natural energy generating device that produces SCALAR energy frequencies that have no negative side effects. Anyone with even a primitive knowledge of science will tell you that this is stupid. All they're doing is using some fancy terms they read on the Internet somewhere. I'm surprised they don't mention quantum physics as well. This product is sold "as is" without any warranty of any kind. Amezcua hereby disclaims all warranties and conditions with regard to this product including all implied warranties and conditions of merchantability and fitness for a particular purpose. influence the body fluid, blood, lymphatic and cellular systems. Increase blood oxygen level & nutrient absorption. Blood is cleansed and its cellular elements function as they should, thereby improving your immune system. Strengthens chemical bonds within DNA making it more resistant to damage. Reverse arthritis, destroy uric-acid in gout, inflammation and much more DISEASE. Binds the tar and nicotine in cigarettes so that the body does not absorb these harmful substances when smoking. PLEASE don't give any of these charalatans the time of day. You certainly shouldn't give them your money. UPDATE: I've just been told that they demand a "registration fee" using your credit card before they start selling you the damn thing. Please don't do it!